Borax is a common natural mineral laundry product that whitens, brightens, and freshens clothes. But when mixed with water in a concentrated solution, borax can form beautiful crystals on any textured surface. Just follow these four simple steps to create decorations or create a school science project. The container you choose should be deep enough so that the base structure you create from the chenille craft sticks can be completely covered by the water and borax solution without touching the bottom of the container. It should also be wide enough so that the base structure does not touch the sides of the container. This will give you the most perfectly formed crystals. If you would like to create colored crystals, just add a bit of liquid food coloring to the water and borax solution. Let your imagination go wild when creating the base structure. You can shape the chenille craft stick into a snowflake, icicle, heart or any shape you desire. The color of the craft stick will show thorough the clear borax crystals; so use a white or very pale blue fuzzy stick if you would like the crystals to look like a natural snowflake. Remember, the shape should be narrow enough to slip inside the mouth of the container without touching the sides and short enough so that it doesn't touch the bottom of the container or the crystals will not form evenly. If you plan to hang the crystals as an ornament or sun catcher, create a hanging hook or loop from the chenille stick. A loop is also helpful when lowering the base structure into the borax solution. To create the crystal-growing solution, simply mix three tablespoons of powdered laundry borax per one cup of very hot water. The amount can easily be doubled or tripled depending on the size of the container and base structure. It is critical that the water be hot enough to completely dissolve the borax powder. Stir well until all of the powder is dissolved. When the borax powder is completely dissolved in the hot water, use a pencil or craft stick and a bit of wire to suspend the base structure in the borax solution. Be sure that the structure is completely covered with the solution and not touching the sides or bottom of the container. Place the container in a spot where it will remain undisturbed for at least eight hours or overnight. This is the watch and wait portion of the project. As the solution cools, some of the borax will settle in the bottom of the container and some will cling to the base structure and crystals will begin to form. If the crystal growth is not as much as you want after eight hours, you can reheat the solution and grow more crystals onto already formed crystals. To reuse the solution, simply remove the base structure and heat the remaining solution in the microwave until the water is very hot. Stir well until all borax particles are dissolved. Suspend the base structure in the solution again and leave undisturbed for another eight hours or overnight. You can repeat this process of reheating the borax solution to grow more crystals until particles no longer settle out to the bottom. 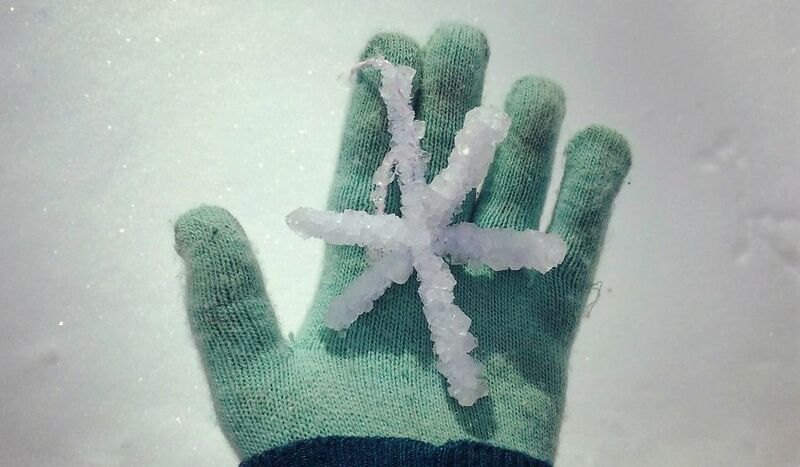 If you are growing the crystals as part of a science project, this is good time to document the growth and learn more about why and how the crystals form. Borax has a solubility of 5.8 grams per 100 milliliters of solution or a 5.8 percent concentration in a room temperature water solution. However, as the water temperature increases, more borax will dissolve. Then as the hot water and dissolved borax solution cools to room temperature, it becomes supersaturated. Supersaturated solutions are unstable and the excess borax will separate and cling to and crystallize on any textured surface. When the crystals have reached the size you desire, remove the base structure from the solution and allow it to dry completely on a paper towel. Once the crystal snowflake or your chosen shape is dry, add a hanging cord and use the finished product in the window as a sun catcher or to decorate a holiday tree or package. The crystals will last for years if kept completely dry. Wrap in tissue to protect during storage.